I had the greatest luck today. After class (where I forgot for the millionth time this term that I did, in fact, have homework to do) Daniel and I went shopping downtown. We stopped at Nordstrom Rack and didn’t find anything good; I tried on a pair of pants that said they were a size larger than what I normally wear, but I could barely get them on and then they just looked dumb because they were six inches too long and I got fed up and we left. I’ve been looking for a dress like this FOREVER. It is not too casual, not too dressy, short-ish and (mostly) strapless. This is the only dress I own that I am likely to wear sometime in the future. 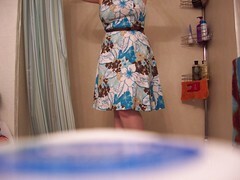 The other is a mommy-and-me dress (my mom has one exactly like it) that she made for me a few years ago. It’s… okay. I’ve worn it once. Years ago. I may wear this dress to my brother’s graduation, weather permitting. It is fun and – best part – only $13 dollars. THIRTEEN. I have no idea how much it was originally but I do not care because it was on sale. You know I love a good summer dress, and THAT is a good dress AND a bargin too, I have dress envy now. That is an awesome dress. I love the colors!